Intensive farming is the industrialization of agriculture and it is essential now that there are so many of us — more than 7 billion souls, most of whom live in cities. This overall intensification of farming began with the industrial revolution and took off after oil and technology became universally available from the 1950’s. It has resulted in huge increases in both crop yield and productivity. 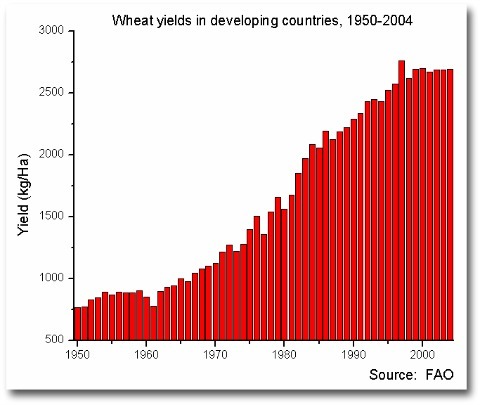 For example, current average wheat yields in developing countries are more than 3.5x greater than they were in 1950. In the scheme of things farming is a recent invention. Domestication of food plants and livestock sufficient for just a few people to till the land and feed many more than their families began just 10,000 years ago. Humans had managed to spread across the world by this time but existed in small numbers, hunting and gathering as they went. Agriculture made staying put possible and with that came permanent dwellings, commerce, culture, and, of course, many more people. As much of the controversy about global warming and the impact of climate change effects is about how fast it all happens [abrupt climate change], it is worth thinking about how recent and rapid the growth of the human population has been thanks to the invention of farming. There were perhaps as few as 1 million humans alive 10,000 years ago. And this represented something of a recovery from the effects of the Toba super-volcano in what is now Indonesia that genetic evidence suggests that some 70,000 years ago might have reduced human numbers to fewer than 15,000 —less than half the average attendance at a mid-table Premiership soccer match in the UK. By 5,000 BC there were 5 million people. By 1,500 AD numbers had grown to 500 million. 500 years later and there were 5,000 million people. Recall that modern humans, the species Homo sapiens, have been around for 250,000 years and the genus Homo for 2.3 million years. This makes population growth following the invention of agriculture staggeringly fast — a genuine population explosion. Industrial scale farming, where the rate of food production is pushed hard through mechanization, nutrient and energy subsidy, usually in monocultures of crops chosen for the local soil and climate conditions, has helped grow more people. Perhaps more surprising than the rapidity of population growth is that agricultural production has managed to keep pace. 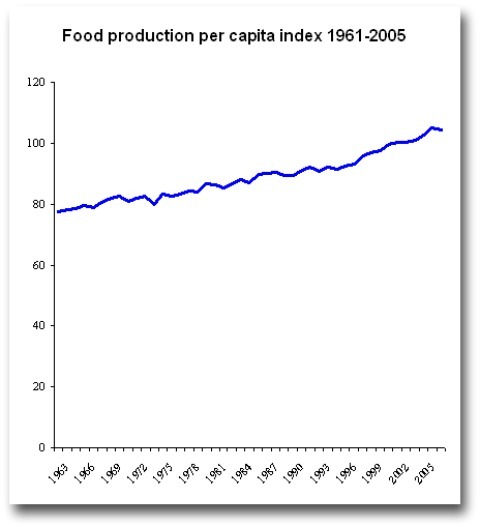 Global food production per capita has increased steadily over the last 50 years, mostly because of intensive farming. This is a remarkable statistic given that in this time the number of people in the world has more than doubled from 3 billion to 7 billion. So far intensive farming has worked. Food production has kept pace with the increasing number of people. Food is also cheaper than it was. Production at scale means that the unit cost is generally lower than it used to be, even though there are many more inputs. Add to this a greater buying power — work for an hour today and you can buy 11x more chicken than you could for an hours work in 1900 — and most consumers find food easily and for a much lower proportion of their weekly budget than in times past. Poverty and famine still exist of course. However, this is more to do with regional differences in production and inequality of food distribution, not because there is not enough food to go around. In the west we waste almost as much food as we consume and many individuals eat many more calories than we need to remain healthy. Most years there is more than enough food to end hunger although, so far, we have no solutions for exactly how we will pay for the necessary redistribution and education to make it happen. Climate change will mean that some crops with intensive production systems will be at higher risk from temperature [heat and frost], moisture [drought and flooding] and seasonal shifts [onset and duration of growing season]. Climate shifts will also expose some crops and regions to pests and diseases that are able to move into new areas that become within their tolerance. A greater frequency and/or intensity of severe weather will increase the probability of crop losses. A failed crop grown on an industrial scale means a commercial scale exposure for the producer. Farm business will operate with higher risk and will need to invest and insure accordingly. When the production system is pushed hard the system is taught, finely tunes and tight. Any extra stress greatly increases the risk that the system will break. In many parts of the world climate change effects will put greater stress on agricultural production. In the past most people could grow most of their own food. Intensive farming made it much cheaper and easier for consumers to buy food. People moved to cities to get jobs to buy food and became physically and psychologically remote from farms. Then along came the television to eat up any spare time that people might have used to grow a few vegetables in the garden. So now most of the global human population is dependent on intensive agriculture — it is essential to keep us all alive. We are long past the point where we can all go back to nature and grow our own food. We are stuck with something that we may not really want.